A cliché (pronounced ‘klee-SHAY’) is a saying, image, or idea which has been used so much that it sounds terribly uncreative. The word “cliché” was originally French for the sound of a printing plate, which prints the same thing over and over. Using clichés is considered bad writing and speaking because they make it sound like you didn’t put any thought into your words. Good writers and speakers try to use thoughtful and original language rather than clichés in their work. Synonyms for cliché include platitudes and banalities. Which means that even in a bad situation, you can usually find something good. “Diamond in the rough“: something or somebody with a lot of potential. “Easy as pie“: very easy. “Cold as ice“: very cold or not friendly. “Take a chill pill“: to relax. “Don’t judge a book by its cover“: don’t judge something based on its appearance. “Driving me crazy!”: annoying somebody to the point of almost insanity. “Kid in a candy store“: feeling happy about the things that surround you. “Light as a feather“: very very light. “Happily ever after“: the ending of all fairy tale romances, this is a typical ending where everybody is happy for the rest of their lives. “When pigs fly!”: something that is very unlikely to happen. Another common characteristic of clichés is that they tend to simplify and dramatize. Rather than admitting that a story may not always have happiness or explaining that serious love takes time to develop, these clichés make the writing seem shallow and therefore un-interesting. “The Damsel in Distress“: a young attractive woman who is incompetent and in need of someone else to rescue her. “The Superhero“: the man who saves the Damsel in Distress, often incredibly strong and good looking! “Brooding Bad Boy“: the boy from ‘the other side of the tracks,’ who needs someone caring to lead him to a better life. “The Good Girl“: the girl who saves the Brooding Bad Boy with her kindness and good heart. Clichés are important because they express ideas and thoughts that are widespread and common within a culture, hence the phrase “cliché but true.” Yet in our culture, we tend to dislike clichés because we place a high value on creativity, originality, and cleverness, rather than on repetition and using other people’s words. Not all cultures feel this way though; in China, it is considered good to use clichés because Chinese culture places a higher value on tradition and looks down on individuality. But even in our culture, clichés are still very common in popular books, poems, movies, television shows, speeches, and advertisements. It is important to remember that every cliché was once original and became overused only because it was such a popular idea at first. So, many clichés come from classic works. This cliché is from Juliet’s speech in which she claims that it does not matter that Romeo comes from her family’s enemy house, the Montague. Like many Shakespeare quotes, this phrase was so creative when Shakespeare wrote it, that now other people have overused it—to mean that the names of things are not important compared to their qualities. And many more. It is a compliment for a writer’s work to become a cliché, but it is an insult to be accused of writing something cliché. Although clichés should usually be avoided, they can be used for comedic effect or in works where originality and deep thought are not expected such as television shows, advertisements, and movies like romantic comedies and superhero blockbusters. Now back to me. Now back at your man. Now back to me. …and switched to Old Spice, he could smell like he’s me. Look down. Back up. Where are you? You’re on a boat with the man your man could smell like. What’s in your hand? Back at me. It’s an oyster with two tickets to that thing you love. Look again. The tickets are now diamonds. This movie is complete with the brooding teenage daughter, the father figure looking for a second chance, and the rambunctious younger brother, who is there just to provide comic relief. These are all clichés. This movie may be cliché, but many people still enjoy it. For this reason, cliché is a matter of taste; critics may not like clichés, but they can still be part of enjoyable entertainment. An archetype is an image or character which is used over and over in literature and art and may not seem cliché because it represents a universal truth about life or a universal aspect of human psychology. The line between an archetype and a cliché is thin: both archetypes and clichés are frequently found in compositions. Whereas clichés are considered overused and unwanted, archetypes are accepted and only cliché if they are represented in cliché images and words. One such archetype is the hero– Superman, Harry Potter, Luke Skywalker, Jesus. This archetype is so common throughout history and all over the world that you would think it would be cliché, but it has such psychological appeal and depth, and makes for such good stories, that we don’t care how cliché it is. Archetypes, unlike clichés, provide a frame for a character or story which is then shaped and presented in an original way by the storyteller. 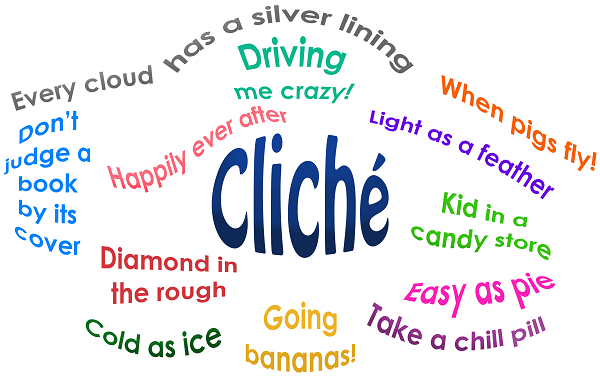 Clichés are, by definition, prevalent phrases or ideas in literature, advertisements, and numerous other forms. They are common in romance novels, parodies, and television. Although critics advise against clichés, they remain popular.